Tuesday Club for the Less Able in Wirral Area. Over a year ago we reported on the activities of the Tuesday Club for the Less Able in Wirral held every Tuesday from 7pm to 9pm at the Lauries Club, Claughton Road, Birkenhead. It is managed by Council 51 Knights of St Columba with the aid of voluntary helpers. 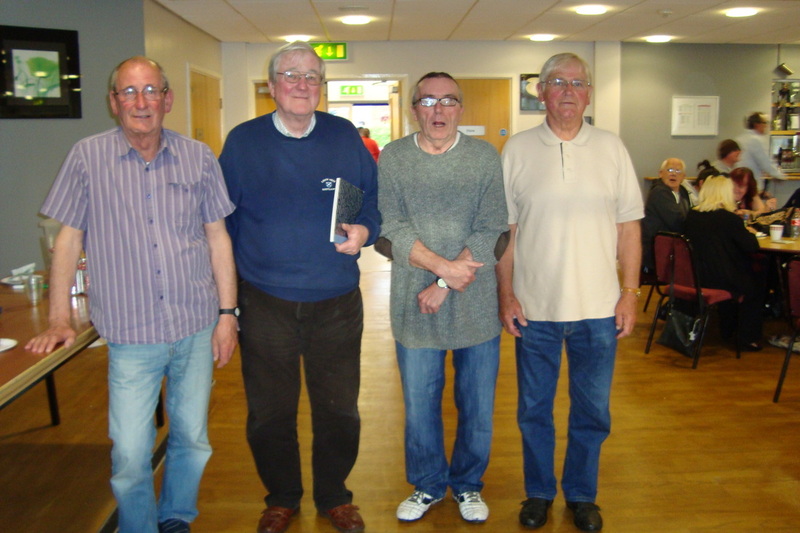 Our picture shows the 4 main members of the Council, Bert Grunnill, Jim McElvogue, Billy Birch and Jim Riley delegated to run the project and who have to manage such tasks as supervising each session, arranging card and bingo games, running the tuck shop and providing food and drinks for around 50 people. Bithdays are always celebrated and a specially made cake is provided on each occasion. Obviously the commitment to provide this service to the Less Able of the Wirral has to be funded and, financial assistance was provided by Wirral Borough Council until recently, but this has become a victim of the Borough Council austerity drive and has been withdrawn. The Knights are therefore forced to find alternative sources of income to keep this vital activity going and in addition to their own fund raising would welcome private donations, which can be sent to Bernard McElvogue, 19, Queens Road, Hoylake, CH 47 2AQ, cheques payable to The Tuesday Club. The Knights are grateful to Asda Supermarket, which has recently contributed £300 through their Green Token Scheme. Each week it costs £57.50 to provide a minibus to take members to and from the Lauries Centre and the cost of the hire of the hall is £30. So we are in the region of £100 a week outlay to keep the project going. Regardless of the difficulties the Knights of Council 51 are determined to continue their good work and are grateful for the goodwill and encouragement shown to them not least by the parents and carers of the Tuesday Club members.